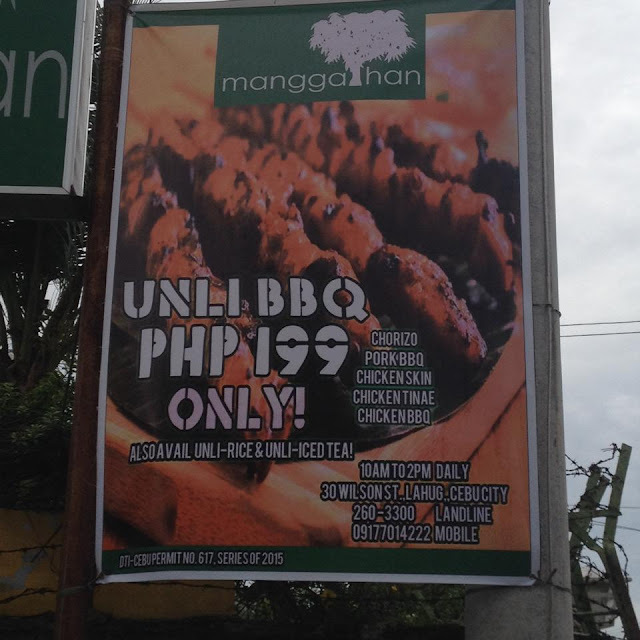 Recently, Manggahan Restaurant at 30 Wilson Street, Lahug, Cebu City advertised on radio that they will be offering unlimited barbecue at lunch everyday. So when I had the chance, I went there to check it out. I went there on a Wednesday. Just as I expected, there weren't too many people around. The restaurant opened at 10:00 a.m. and I was the first person to come in. By the time I left at around 11:30 a.m., there were only three other sets of customers. Manggahan's unlimited barbecue lunch features pork barbecue, chorizo, chicken skin, chicken tinae (intestine), and chicken barbecue. The unlimited barbecue does not come with rice and drinks. Rice and drinks are sold separately. Of course, I had to order unlimited rice to go with the grilled items. I could have settled for service water too. I decided to order the bottomless house blend iced tea anyway. After a full day's work at Mactan Island, we went on to treat ourselves with a dinner buffet. We went to Harold's Hotel's H Cafe on a Saturday night. Saturdays are pasta and carvery night on H Cafe's nightly themed buffet offering. I shared dinner on that Saturday night with Joyce and Ting. H Cafe at Harold's Hotel offers a themed nightly eat all you can dinner buffet in Cebu City. Wednesday and Saturday nights are pasta and carvery nights. A selection of food rolls such as beef shawarma and roasted pork loin is available on Thursday nights. 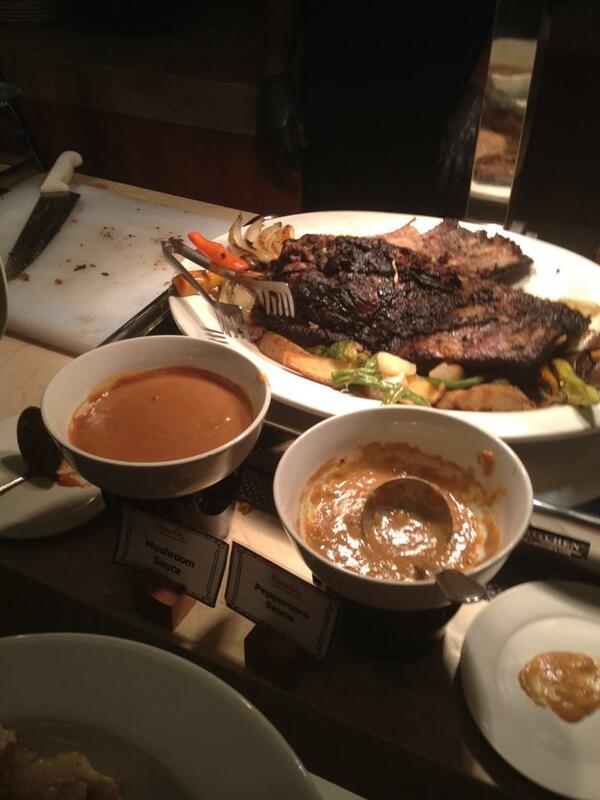 Hot Off-the-grill BBQ buffet welcomes diners on Friday nights. I'm not really big on pasta. But those who love Italian food will have a great treat waiting for them at H Cafe on Wednesday and Saturday nights. you can enjoy their pasta selection includes Fettuccine, Penne, spaghetti, and macaroni. They can go with carbonara, Alfredo, Bolognese, Pomodoro, and Pesto sauces. Now the carvery section is a different story for me. It features Harold's special lechon belly, Angus beef, and roasted chicken. I just love meat! I kept coming back for the lechon belly. I did not enjoy the roasted chicken and Angus beef as much. We have had too much pork, beef, or poultry to eat for the past few days. So a seafood meal is a welcome break. A seafood meal was what me and my family had one hot September day at Lantaw Native Restaurant SRP. There's a lot of seafood dishes available on the menu of Lantaw Native Restaurant. We ordered garlic buttered prawns, calamares, sinuglaw, seafood pinakbet, grilled tuna belly, and Cordova express. We also ordered a platter each of plain rice and garlic rice. For our drinks, we had a pitcher each of Cordova cooler and SRP cooler. I am a sucker for prawns in any way it is cooked. 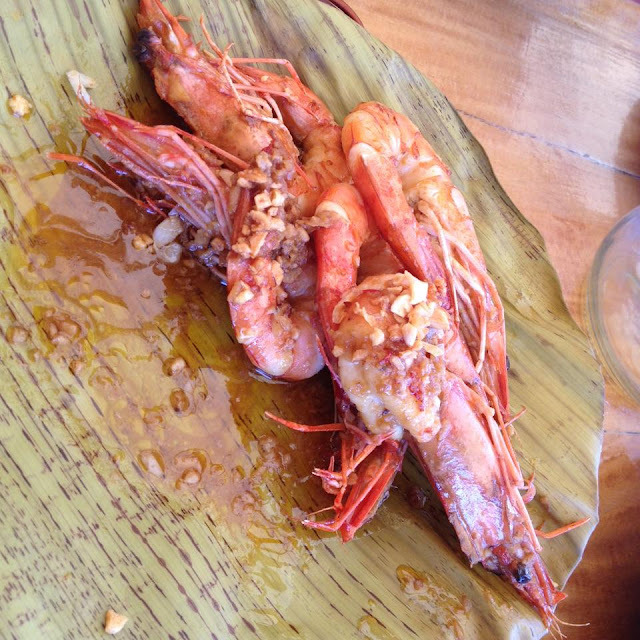 I enjoyed the garlic buttered prawns at Lantaw Native Restaurant. The size is not too big. But it is rich in flavor. I enjoyed every bite of it. They also peeled off the shell on the meaty part. That made it an easy dish to eat as well. For a more detailed information on the history of Parian, it is best to drop by the Museo Parian sa Sugbo. It is located at the Jesuit House of 1730. The Jesuit House is the oldest dated house in Cebu and the Philippines. It is a house made of cut coral stones, tugas (or molave?) hardwood floors and posts, and terracotta (tisa and red clay?) roof tiles. Curiously, the museum is located inside a warehouse owned by the Sy family. It was adjudged as the best public museum in SunStar's Best of Cebu Awards 2014. 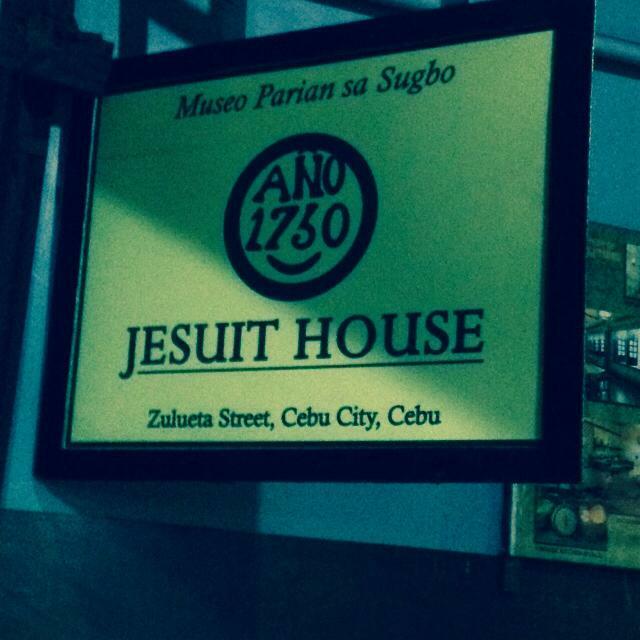 The Jesuit House of 1730 is located at a warehouse on Zulueta Street, Parian district, Cebu City. 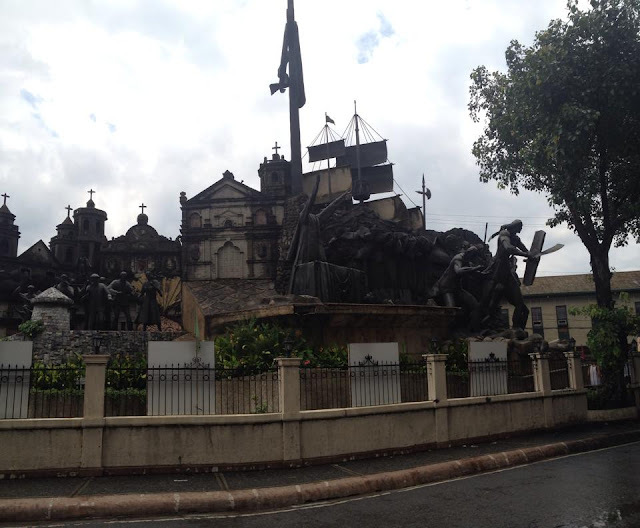 It is around the vicinity of the Heritage of Cebu Monument on old Plaza Parian. It is walking distance from the Calle Colon Obelisk, the Parian Fire Station, the Parian Police Station, and the Yap-Sandiego Ancestral House. For Google Maps users, please CLICK HERE. The Parian district was once the center of society and culture in Old Cebu. This is where the wealthy Chinese merchants plied their trade. In fact, the name Pari-an was derived from pari-pari. The term means "to trade". I had a chance to relive Parian's glorious past. Thanks to the program rolled out by the Cebu City Tourism Commission. It was called the Bisita sa Parian. This program was done last 11 September 2015. 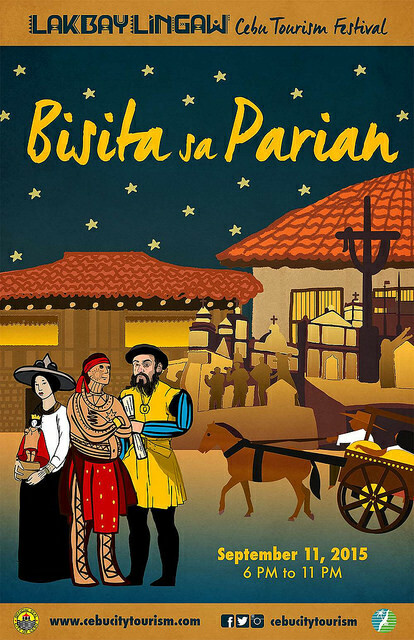 The Bisita sa Parian treated visitors to several activities such. I was able to visit to the Yap-Sandiego Ancestral House. I also went to the Jesuit House of 1730 which houses the Museo Parian sa Sugbu. They offered tartanilla rides. Local delicacies and dinner were made available at the Cafe Jardin de Rafael. Doce Pares demonstrations of arnis, kali, and eskrima were done at the Plaza Parian. Rrondalla music was played. There was a cosplay of historical figures. The Sandiego Dance Group also had dance performances. One of the oldest houses built in the Philippines that is still standing today is the Yap-Sandiego Ancestral House in Cebu City. Parian was once the center of society and culture in Old Cebu. The house was built in 1675. It celebrated it's 340th last October 2015. The Yap-Sandiego Ancestral House is considered to be one of the oldest existing residential structures in the Philippines. 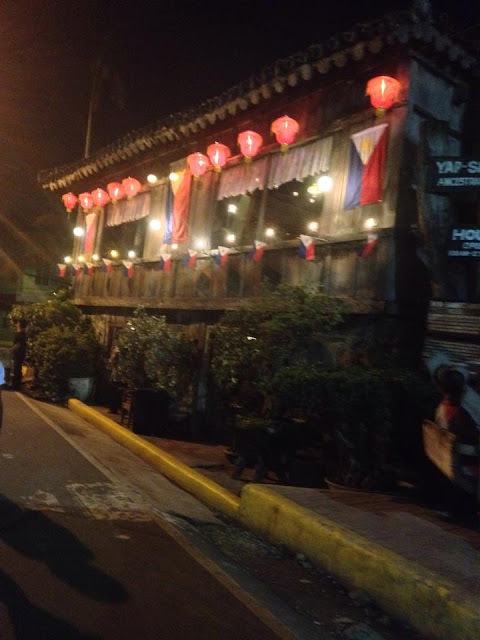 The Yap-Sandiego Ancestral House is a Bahay na Bato ug Kahoy. It is made from wood and coral stones. Authorities in heritage and history certified that the old coral stones are 95% authentic. Cebu's first and biggest year-round weekend market for food and lifestyle opens at Cebu IT Park on September 25, 2015. Sugbo Mercado will bring together budding new entrepreneurs in the food and lifestyle products industry to showcase their products. It will also be a venue for corporate and product launches. There will be roadshows and food and cooking showdowns. Bands will also perform. And there will be other promotions as well. Sugbo Mercado has partnered with Cebu Holdings Inc. Other co-presentors are OLX Philippines, The Islands Group, Sun Cellular, and Foodpanda. OLX Philippines is the biggest global brand in online classifieds. Foodpanda, the easiest way to order food online from more than 500 restaurants, will officially launch at Sugbo Mercado later in the month. Everywhere you look around in Cebu City, you will almost always come across a place that serves siomai in their menu. Siomai or shao mai is a Chinese dim sum dish that has now become a Cebuano and Filipino favorite. They also serve almost the same varieties, so newcomers to the business need to really be creative with their unique selling propositions. They cannot just offer what is already being offered in the market. 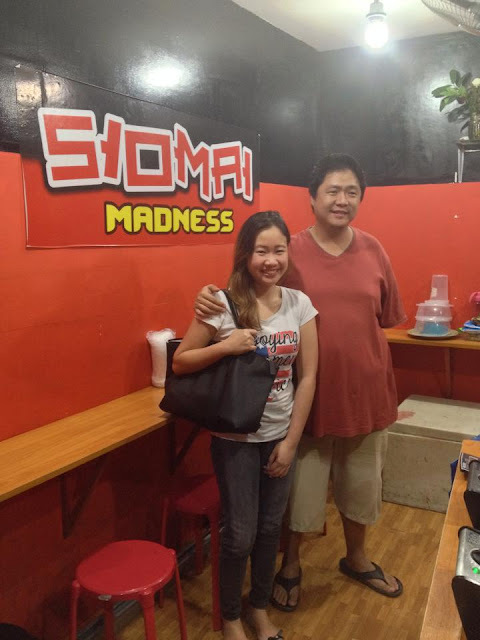 Should they want to ride on the food crave craze generated by the siomai sa Tisa train, they have to offer something far different and memorable. Whether it be better taste, delicious sauces, more affordable prices, unique experiences, or just about anything that will make them stand out. Enter Siomai Madness. They opened their first branch at the Southwestern University main campus in February 2015. It has now grown into four branches across Cebu City: at Southwestern University, at B. Rodriguez Street, at the Asian College of Technology P. Del Rosario campus, and at the corner of F. Ramos Street and Ranudo Street, right across the entrance gate of the Cebu Institute of Medicine. Diners vary in how hot or spicy they want their chicken wings served. Thankfully, Gibb's in Cebu City offers their patrons five levels of how spicy you want your chicken wings served. The 5 levels are Hot, Original, Insanely Hot, 2 Intense, and Freakin' Hot. I chanced upon the Gibb's branch at Streetscape Lifestyle Mall along Maria Luisa Road in Banilad, Cebu City, Philippines with a friend one weeknight. We tried some of the food items they had to offer in their menu. Hot chicken wings and pasta is what dominates the Gibb's menu. 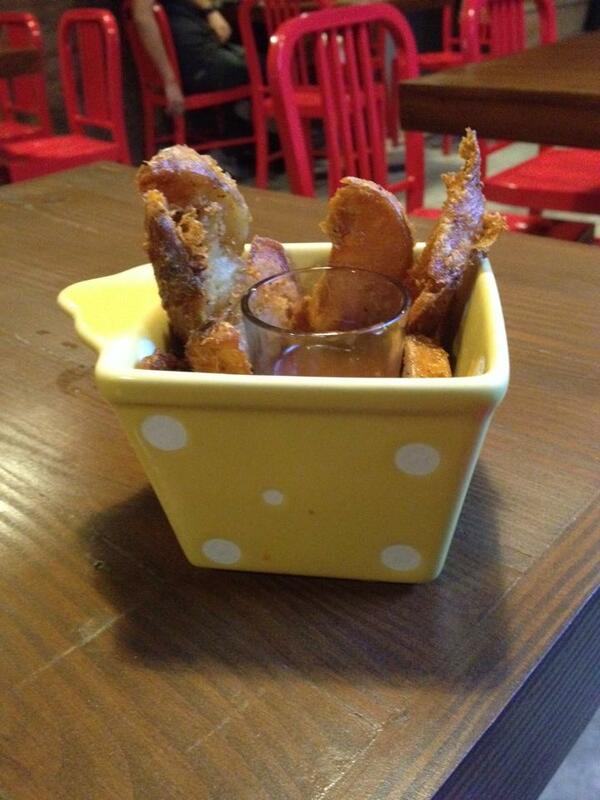 They also serve potato wedges and mozarella sticks. We first ordered the Honey Garlic hot chicken wings and some potato wedges. We had a pitcher of iced tea for our drinks. The honey garlic flavored wings were okay. It had a sweet blend with a little spiciness, not too spicy even kids will be able to enjoy it. We all know how Filipinos love their food with a sweet blend. Cebuanos are definitely not that much different. After all part of Cebu (mostly in the northern part of the province) is sugarcane country. Inflation diminishes the value of your money. That's why we always lookout for good deals that stretches the power of the Philippine Peso. I have been hearing about this farmers' market at the SRP Access Road near the University of Cebu-Maritime Education Training Center in Mambaling. Many say, you can buy fruits, vegetables, and spices here at very good prices. They say it probably is the cheapest in the city. So I went there twice with my brother, once on a weekday and once on a weekend. 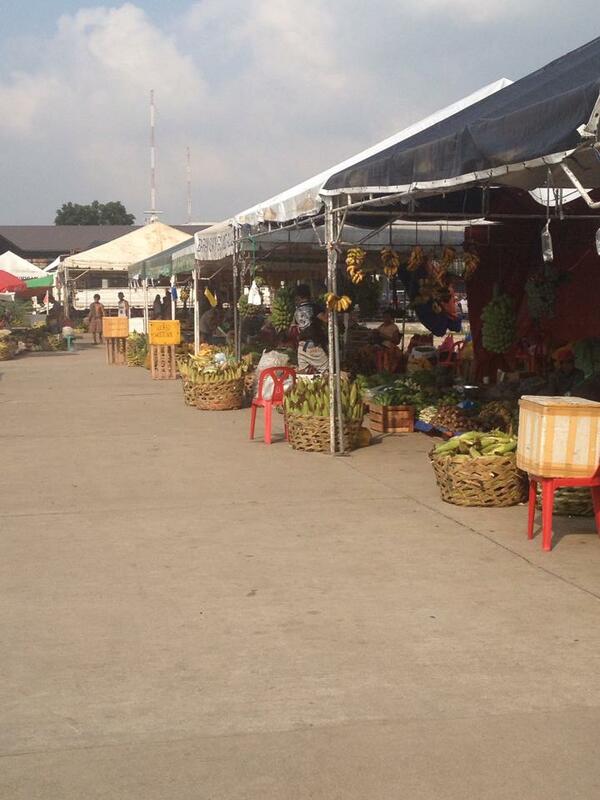 The farmers' market at the SRP's Mambaling Access Road is a pet project of Bando Osmena Pundok Kauswagan patriarch and former Cebu City congressman and mayor Tommy Osmena. It started as a weekend farmers' market. Recently though, they are now open even on weekdays. But based on experience, it will still be best to go there on a weekend. Weekend prices are lower and better monitored compared to weekdays.